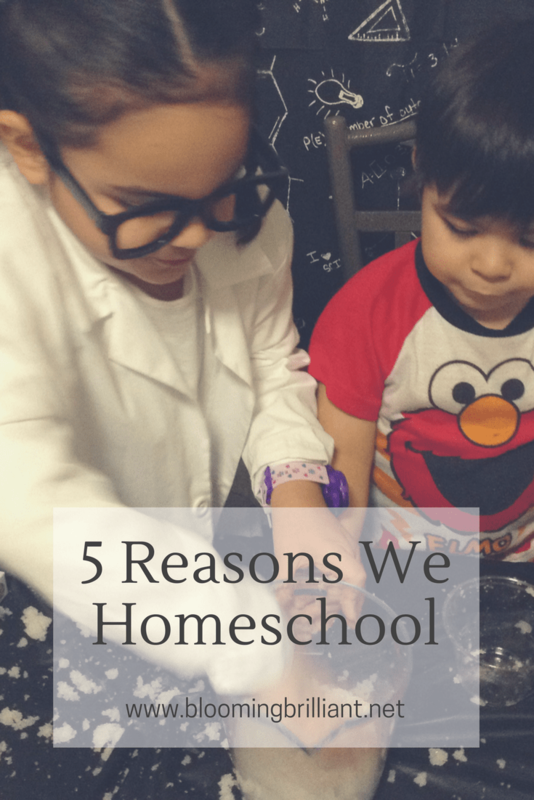 One of the most popular questions we get is why did we decide to homeschool. I get this question so many times that I figured it would be best to address it. People have so many preconceived notions when it comes to homeschooling. In this post, I want to explain why WE homeschool. I also filmed a short video giving some background on why we began homeschooling and some of the big causes and options we had. As you may know, Blooming Brilliant was born shortly after my daughter Isabella. It started out as a place where I could share my journey and experience, the good, the bad and the ugly. I fell in love with early childhood education and started sharing everything I was learning with regards to psychological development. All these educational games, techniques and tools we used with Isabella really stuck. She is truly a gifted child. I am pretty sure she was born gifted but all our educational pursuits in her baby and toddler years had to contribute something right? When Did we start homeschooling? I count all those baby, toddler and preschool years as homeschool. We had fun learning through play and I loved watching her grow and learn. I loved being with her and spending time making and doing things together. Even though I wanted to continue our homeschooling journey, we thought it best to enroll her in a local public school in the gifted and talented class for the first grade. Isabella really enjoyed traditional school. Her favorite class was drama (go figure!) and she loved her teacher and class so much. She still does. However, she wasn’t being challenged in school. Most of the topics in the class were really easy for her, she was looked at as little miss perfect. Her friends and classmates would quiz her at lunch and recess. She helped correct her friends work and so on. She also missed being home and participating in things her brother and I were working on. I missed having her home but I also enjoyed the break of having to teach two kids and a home-based business. Sending her to a faraway school which she will have to be bused to. I didn’t love the idea of having her so far away, I liked bringing her to school and picking her up, I liked being able to get her in a pinch if she wasn’t feeling well. Having her skip a grade. Kids are growing up so fast!!! We didn’t want our daughter surrounded by a bunch of older kids and learning things that she might not have been ready to learn about or that we would rather talk to her about first. Homeschool, where we can teach her based on her learning level and not her age. Education- it is important to us, we love that with homeschool Isabella can learn to her level and not her age. Freedom of Time- we love that we are in control of our time, we can have a relaxing pace to our day. Freedom of How we Learn- freedom over what books or curriculum we use and how deep we dive into a subject, adding certain things to our lessons. Mastering- being able to learn a topic completely and really being able to master it before moving on. Values- being able to make sure our values are shared throughout subjects and topics. Check out my video, where I get a little silly and explain a little further the 5 reasons why we homeschool. Are you a homeschooler? Why do you homeschool? Are you interested in homeschooling? What are the reasons it interests you? Let us know in the comments below. We would love to hear your reasons and thoughts.